More than 200 Vanderbilt University School of Nursing students received their professional pins of Nursing at a ceremony on Sunday. VUSN Dean Colleen Conway-Welch, Ph.D., welcomed a crowd of more than 2,000 family members and supporters to the ceremony, held at Belmont’s Curb Center due to construction at Langford Auditorium. Couples who undergo infertility treatment often find the road both arduous and lonely. Although the woman and her partner receive ample information about the medical side of treatments like in vitro fertilization, for example, they can often be unprepared for the anxiety and depression that can accompany the path to either parenthood or child-free living. More than 200 Vanderbilt University School of Nursing students received their professional pins of Nursing at a ceremony on Sunday. VUSN Dean Colleen Conway-Welch, Ph.D., welcomed a crowd of more than 1,600 family members and supporters to the ceremony, held at Belmont’s Curb Center due to construction at Langford Auditorium. 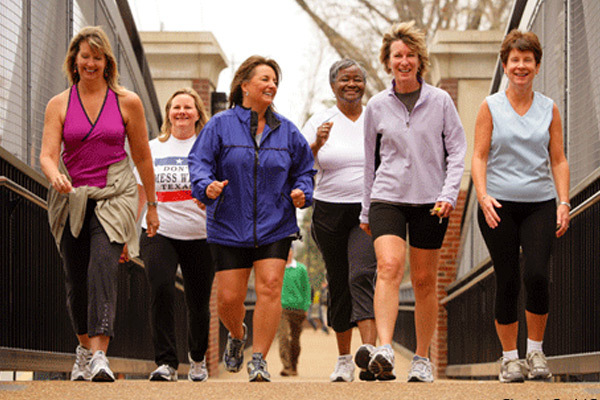 Determined to remain physically fit despite their busy schedules, a group at the School of Nursing (l-r: Crickett Harmer, Lee Ann Ruderer, Jacque Holling, Peggy Cameron, Carolyn Arakelian and Roberta Bradley) has found a way to make exercise a regular – and meaningful – part of their daily lives. More than 200 Vanderbilt University School of Nursing students were recognized in a special ceremony on Sunday, receiving their professional pins of nursing for finishing the specialty program of their choice. The designation signifies that they can now begin working as nurse practitioners.